One of the things that I love about celebrating the holidays is the appetizers that tend to be part of those celebrations. Appetizers are fun and delicious! You can eat them with your hands, a toothpick, or a cocktail fork. You can eat them while moving around “visiting” with people. There’s usually lots of variety when it comes to appetizers, too. You’re not just stuck with one or two main dishes and I love that, because I always like to sample a little bit of everything! My family always enjoys a buffet of appetizers on Christmas Eve and I’ll be bringing these Paleo Pigs in a Blanket this year. 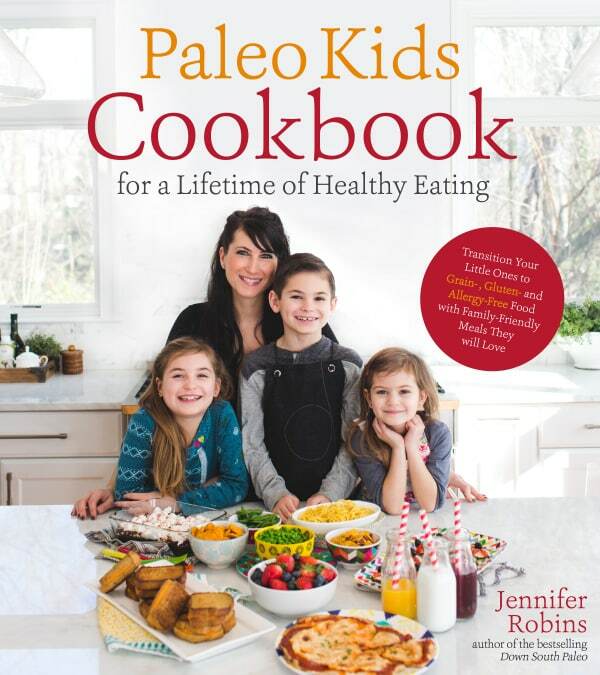 As Jennifer’s recipe is paleo, it’s not only gluten free, but it’s also free of grains, dairy, and soy. This recipe also happens to be free of eggs and nuts. But look at these tasty Paleo Pigs in a Blanket. They look so appealing! Jennifer says that whenever she serves them at events—kid focused or adult focused—they’re always the first to go. I’m not at all surprised! I’m sure they won’t last long on Christmas Eve. Pigs in a Blanket are one of Mr. GFE’s favorites. I’m sure he’ll love these Paleo Pigs in a Blanket just as much as the gluten-full version. Son and I haven’t had pigs in a blanket since going gluten free, so we’ll be very happy to enjoy them once again as well. Paleo Cooking With Your Instant Pot: 80 Incredible Gluten- and Grain-Free Recipes Made Twice as Delicious in Half the Time. Before we all head off to make Jennifer’s Paleo Piggies, I also want to point out that Jennifer recently started a company named Legit Bread, which sells grain-free, paleo bread by the loaf—“ready to eat” and also in mix form. Her bread comes in two flavors–original and blond. Plus Legit Bread also offers grain-free pancake mix and grain-free bagel mix. All of these products are also nut free and customers rave over them! Check it all out here on her website. You can even order these products on Amazon. Clearly, Jennifer is a gift to the gluten-free and paleo community! I don’t know how she does it all, but I’m grateful! Today is her birthday. Happy Birthday, Jennifer! 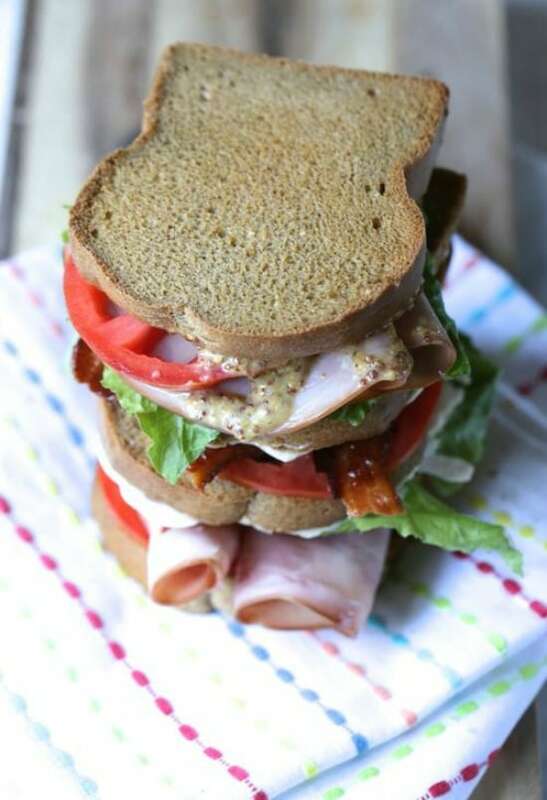 You can follow Jennifer on a daily basis at her blog, Predominantly Paleo or on Facebook here. Jennifer says: "One of my favorite party food appetizers, I’ve served these at everything from my kids’ birthday parties to adult gatherings, and they are always the first to go! These certainly don’t use dough from a can, but they are always a hit nonetheless!" This recipe is grain free, gluten free, dairy free, egg free, soy free, and nut free. Combine all of the ingredients, except for the hot dogs and Honey Mustard and knead together until you can form a ball of dough. Divide the dough into 4 equal pieces. Take one piece and roll it out in to a round flat disk about ⅛-inch (3-mm) thick. Slice it like a pie into 8 triangles. Roll one hot dog into one triangle, starting at the widest part of the triangle and rolling towards the point. Place the dough-wrapped dog on a parchment-lined baking sheet. Repeat with the remaining dough and hot dogs. Bake the piggies for 15 minutes and remove from the oven. Allow them to cool slightly and serve alone or with Honey Mustard for dipping. For little hands: Allow your child to help mix the dough and knead it. 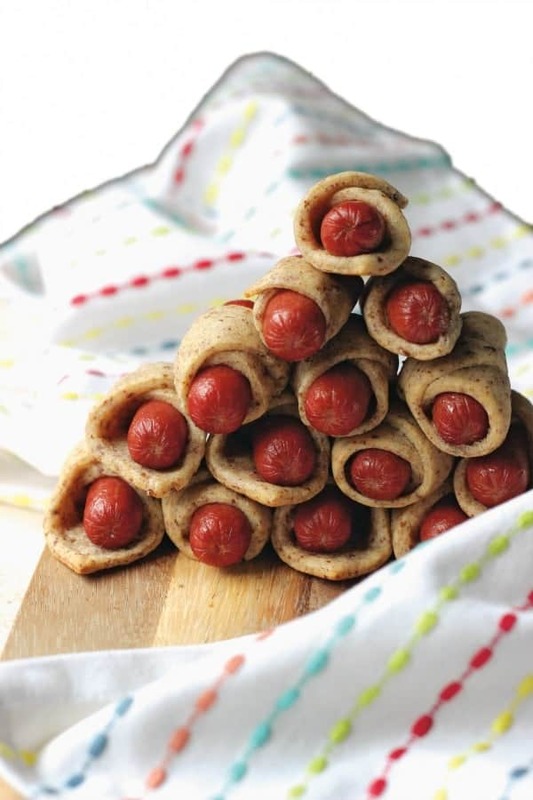 Your little helper can also help roll the dough out and roll the hot dogs into the triangles. Do not worry if they aren’t perfect; they’ll be delicious nonetheless! Originally published December 14, 2016; updated July 24, 2017. My kids will LOVE these!! Thanks for the recipe! Yay, Lisa! I love making your kiddos happy! 🙂 Hope you all enjoy them! This appetizer is always a hit. Thanks for the gluten free version. Hi Deb–You’re so right! 🙂 You’re welcome, of course. Happy Holidays! Where oh where do I find grass-fed hotdogs? Hi Susan–It’s good to see you again. 🙂 I’m sure you’re not the only one that has that question. 😉 Applegate hot dogs are grassfed. They are beef vs pork though. There are some other brands that you can find online, but Applegate hot dogs are the ones I can find locally. I prefer beef hot dogs over pork hot dogs. And, of course, you can use any hot dogs you would like in this recipe. Enjoy! Jennifer sounds like a very talented lady, and I love the resources you have shared here, Shirley! Her books look so interesting, and I love those cute Paleo Pigs in Blankets. They are perfect for any celebration. Pinned! Thank you for sharing with Hearth and Soul. Just wanted to let you know, I’ve featured these cute Paleo Piggys at Hearth and Soul this week. Hope to see you there, Shirley! Happy New Year!